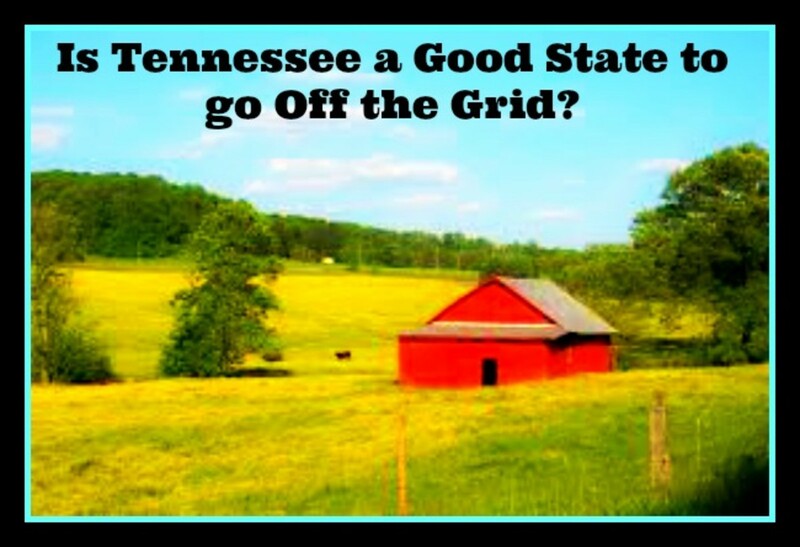 Have you ever wanted to lower your electric bills or simply sack them off altogether and go off grid, But you haven’t got any idea on how to go about heading in that direction? 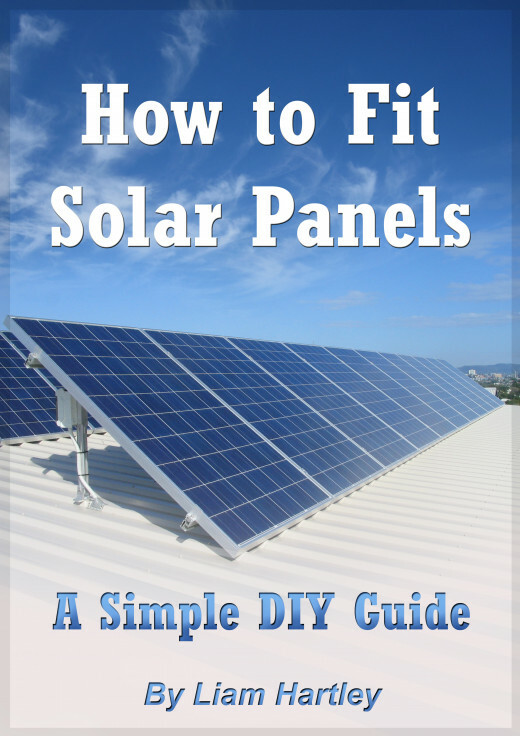 Well you have come to the right place as the eBook ‘How to Fit Solar Panels. A simple DIY Guide’ is a fantastic way to learn the basics of setting up your first ever solar panel project and putting a dent in your electricity bills, adding constant renewable energy to your motorhome or van and getting you off the grid! With electricity prices soaring and the world getting more and more polluted more and more people are wanting to invest in solar panels for many reasons. Whatever your reason is, now is the best time to invest and as you do you will definitely never look back! 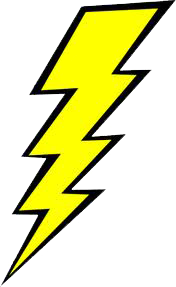 You need to know how much power is going to be needed to run the items that you want to run off of solar power! To do this we need to determine which electronic devices you would like to use, powered from solar power. Once we have become settled on the items that we would like to have run entirely off of free energy we then have to find out how much power they use. Most devices will have wattage ratings on the item itself or on the box that it came in. These wattage ratings can then be multiplied individually by the number of hours that we intend to use that specific Device in which we call ‘’Watt-hours’’ (Wh), This is a unit of power consumption. For example we would not want to work out the watts of two different devices and times them by one hour, instead we would work them all out individually! For example if you intend to use a 15W device for 3 hours in one day, we would work that out as 15W x 3h = 45Wh. Please do keep in mind that most ratings are usually higher than the power consumption and we can determine what each device actually draws by using a meter such as a kill-a-watt. I have never tested all of my devices this precisely and I have never come into problems with my set up. This may change for different people and devices so it is advisable however you can just add on an extra percentage to your findings and not forget that you can’t leave it running for hours at a time if you calculated you would only use it for one hour at a day. Once you have all the Watt-hours, add them up. If you are planning on building a solar set up that can power larger amounts of a total of devices and hours that exceeds 1000Wh then this how to eBook may not be suitable to your full set up but a good guide on learning about different techniques within smaller set ups. Don’t think that the information here will be wasted though as I have multiple set ups on my site that are all beneficial to have! Just because a setup is smaller in power doesn’t mean that it isn’t good for a job! Next On the to do list is to work out roughly How much full unobstructed sunlight you can receive in the locations on the premises that you intend to set up your solar panels. Unobstructed means that there are no shadows being created at any length of time that are created by trees, building, or any other object that can cast a large enough shadow in one particular spot for a long period of time! You don’t want to be placing your solar panel in a sunny spot that only receives sunlight for 3 hours a day, however if you have a spot that doesn’t gain sun for 2-3 hours in the morning but receives direct sunlight in the afternoon then this is a suitable area! Take in to consideration that within the winter months the sunlight and direction of sunlight will differ and you may not receive any great lengths of sunshine during these months. You can however get solar panels that do not need direct sunlight and I would highly recommend purchasing these none direct sunlight panels if you can afford to spend a little more money as you will benefit from these a lot more than standard panels. These also help by maximizing the amount of sunlight that can be gathered within shady areas, under cloud cover and even covered with a dusting of snow! How much Power can you get? 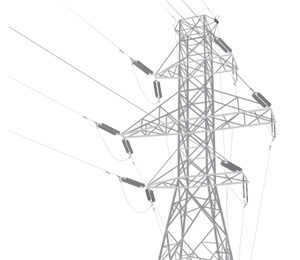 How much power you can get will depend on both factors that we have just covered, taking into consideration both calculations of maximum direct sunlight (try to calculate winter sunlight hours if possible) and calculating this with the WH (watt-hours) that the devices you intend on using added up to. For example if you decide that you need 600Wh and that you get 6h of sunlight. That would mean that we calculate 600Wh / 6h = 100W. This calculation determines the amount of power you need to generate per hour of sunlight to meet your needs. As I said before with these calculations. Once you calculate the formulas above always be save and multiply the end result by at least 2, This is to cover yourself and your set up to account for the fact that solar panels are extremely weather dependent and we live in a very temperamental world. 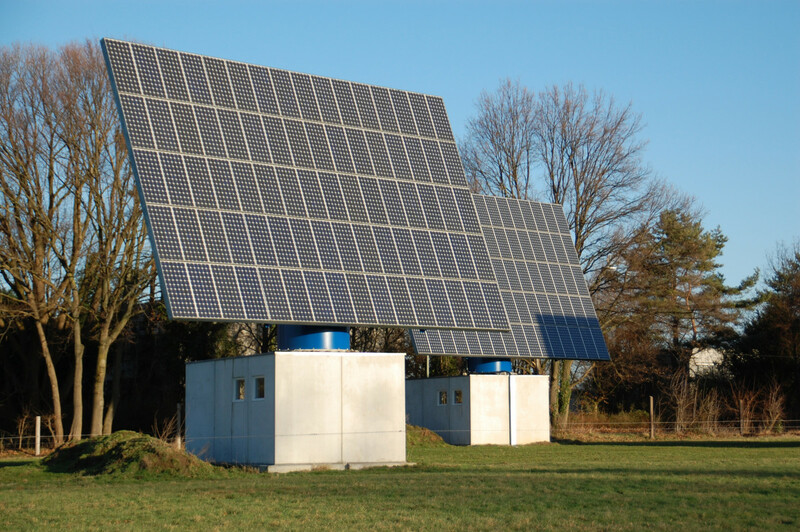 All solar panels will only ever generate their full rated output when pointed directly at full sunlight (unless you can purchase none direct solar panels for a higher price). Also take in to consideration as to where it will be that you are going to be fixing your solar panels as if they are at an angle or on a roof top that they may not be facing directly at the sun for all of the calculated daytime. Depending on the inefficiencies of your setup I would expect to lose an average of 20 percent in power generated within a 2 week period due to bad weather conditions. However I would not let this put you off from getting free electricity and unlimited amounts of free energy. This is easily deterred by simply doubling your calculations. For example, if you were to want to power the above formula of 600Wh over a period of 6h in which would equal to 100w. We would simply double the outcome and have a 200w panel! This will help generate double the needed amount of energy and help to cover on any loss of energy due to dark stormy days and sunlight lost to shadows! If however you are prone to dark cloudy weather and cannot rely on these calculated methods for an average time of daylight then I would recommend tripling the outcome for any guaranteed power! 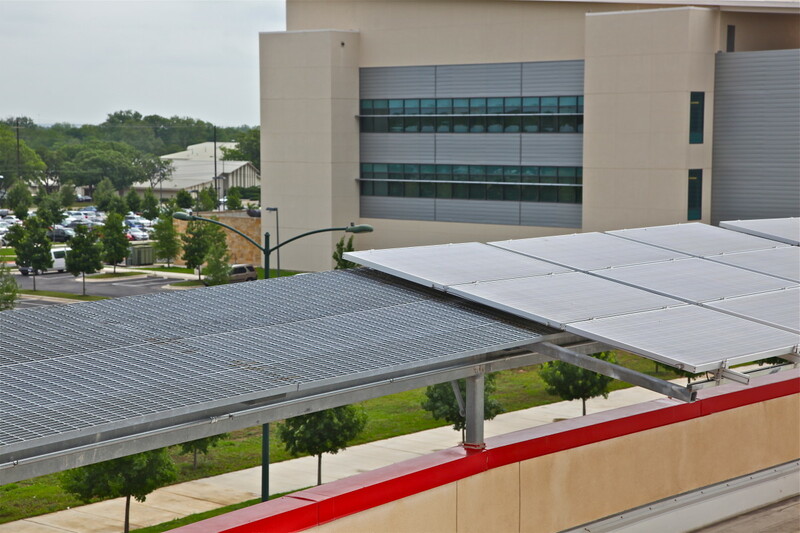 This may sound like it is going to be going against you but if your power goes down due to a storm, or for any reason you are out of power for a short period of time you will always have these solar panels generating power every day! After 6 or 7 months of use or 3 or 4 months of high usage you will be soon benefitting off of your new solar panels! The calculations within working out solar panels and what you can generate and what you will be using are actually very easy to get your head around after you work out a couple of formulas! For a quick example of an average day’s use of power we will look at this average. Setting up the solar panels is the final thing to do after you have researched in to all of the above steps and purchased the required items for your solar setup! Setting up your first ever solar panel setup is going to be a lot easier than you think and you will have it done in no time! It would be beneficial if you had yourself or you had somebody with you who had some electrical knowledge but it isn’t necessary at all. To set up the solar panel setup you will need the following things. First of all we want to set up our batteries in a bank. If you only have one battery then this is not necessary to follow. I would recommend purchasing at least two batteries for any setup however it will work (poorly) with one battery! 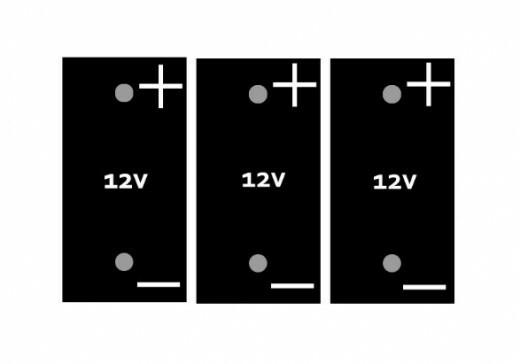 To set up a battery bank we want to first set up the batteries with all of the positive and negative terminals facing the same way as shown here! Once setup add the Lugs to the batteries to allow wire attachment. This allows us to take four wires and hook the batteries in to parallel! This will not make the batteries larger in voltage but will allow for us to have a longer AH (amp hour). So if these batteries are hooked up as shown below this text. Each 120AH battery will join together to give us 360AH! If you decided to purchase golf cart batteries and have 6v batteries you will need to join them in to series to make 12v batteries. 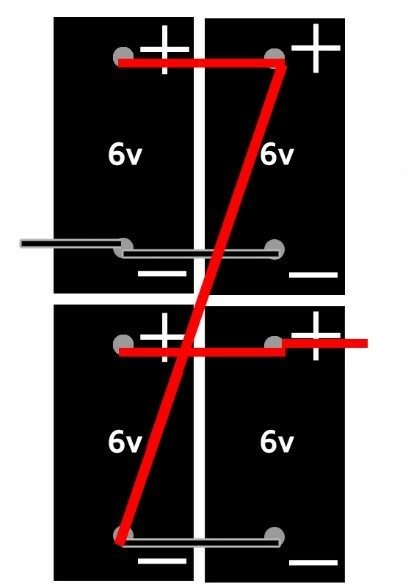 To do this we simply take the method shown above and apply it between two 6v batteries from negative to positive as shown below in the image. Don’t get too confused as it is easy to work out. Electricity flows through a parallel connection just the same as it does in a single battery. It can't tell the difference. 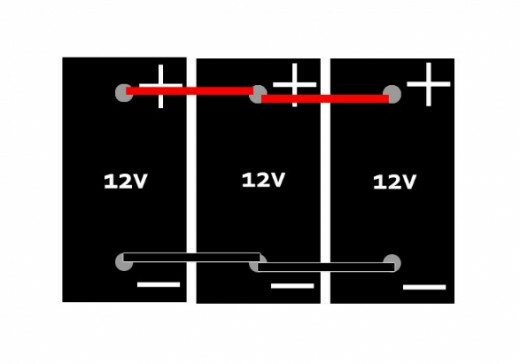 This means you can connect two parallel connections in a series as you would two batteries. Only one cable is needed, a bridge between a positive terminal from one parallel bank to a negative terminal from the other parallel bank. You can connect more than one connector to each terminal, it is necessary to successfully construct these kinds of battery banks. In theory you could build a battery bank of thousands of batteries however the more batteries you add to the bank. The more tangled up the wires will get and lead to more problems. So with that in mind I would stick to 4 batteries max in your first setup! As mentioned above make sure that you stick to the same battery sizes, capabilities and even make if possible! See below for details on the next image to help you understand. 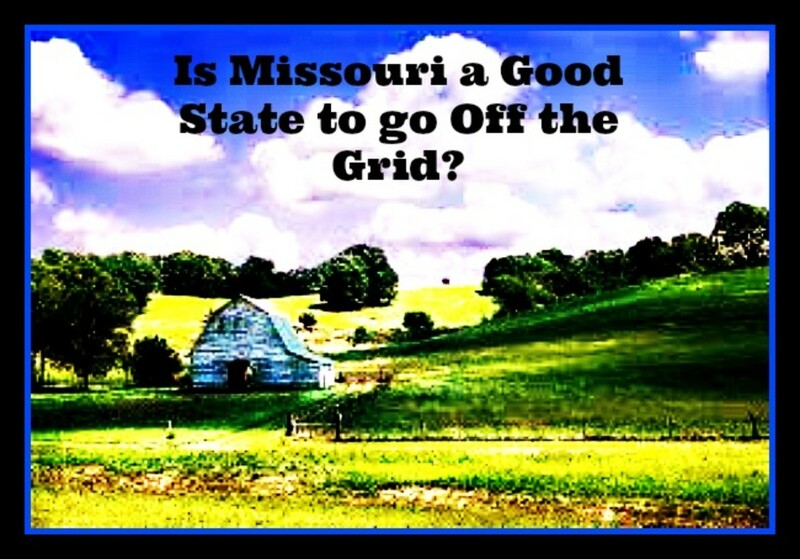 Next you will want to do the same for both the solar panel/s and Inverter! This is the same technique over and over again using the same terminals! So I won’t draw up a diagram for each item and will give you a diagram of the completed setup! As seen below! I would highly recommend fitting some fuses between the battery bank and inverter just in case of any sudden surges. Chose the correct fuses for your setup and place them in a fuse holder between the batteries and the inverter and this will lead any surges to blow the fuse and not your devices and inverter. 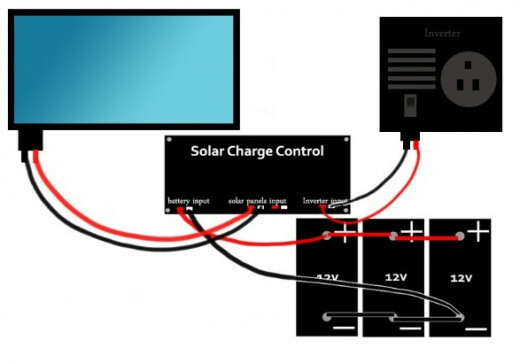 Use the provided thick solar panel wire that came with your kit to go from the solar panel connectors and control panel and from the control panel to the batteries. Normal electrical wire that is capable of holding the necessary current that you will pull is used between the battery and inverter and any other added additions such as cigarette lighter sockets which can be added using the provided wires that come with the socket or you can use the same wire you used to wire up the inverter. 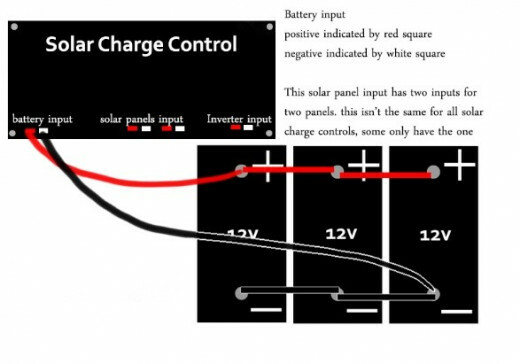 Some inverters may not be able to be fitted directly to the solar charge control and instead will be fitted straight to the battery banks using the same method of negative to negative and positive to positive. 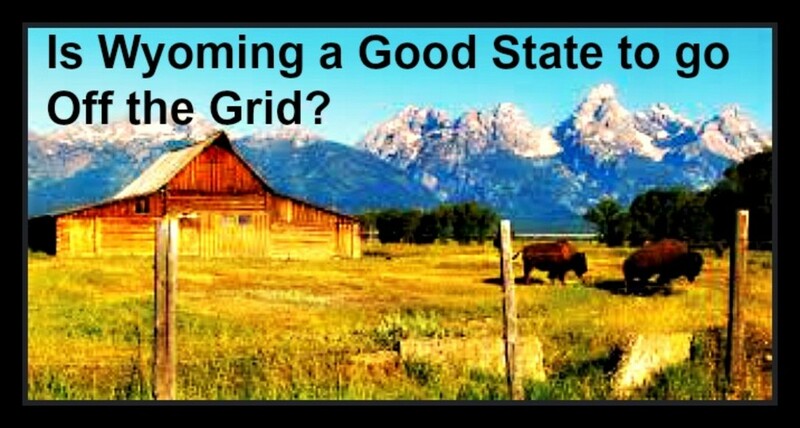 For a More in depth look at installing Solar Panels I would highly recommend heading over to the Link provided below to an Amazing eBook that shows you everything you need to know!